The websites and applications that form the Board Direction sites (hereinafter referred to individually as the “Board Direction Site” or collectively, the “Board Direction Sites”) are owned and operated by “Board Direction Pty Ltd”. These terms govern your subscription to any product available through the Board Direction Site. These terms, together with the Board Direction Conditions of Use, form part of the general terms and conditions governing the material on, use of and access to the Board Direction Sites. Board Direction may change these Subscription Terms from time to time. If we do, any amendments will be posted on the Board Direction Sites. If you object to any changes to these Subscription Terms, your only remedy is to cancel your subscription prior to renewal of your subscription. If you do not cancel your subscription prior to renewal you will be deemed to have accepted all changes. Your subscription will not be valid unless and until Board Direction accepts your registration. You must ensure that your username and password remain secure and confidential. You are entirely responsible for all use, activities and charges associated with or arising from any use of your username and password (regardless of whether you authorised such use), including unauthorised use of your or any other credit card. Each username and password must be used by a single user and is not transferable. An attempt to login with a username and password that is already in use will disconnect the other user. You must notify Board Direction immediately if you become aware of any unauthorised use of your username and password. Board Direction may (but has no obligation to) monitor usage of the Board Direction Sites via your account (including but not limited to concurrent usage of username and passwords) and may take any action it deems appropriate, including immediately terminating your subscription. For the current fees for products, services and other features offered in connection with the Board Direction sites, please go to the relevant Board Direction site. Board Direction reserves the right to change the fees it charges for products, services or features offered in connection with the Board Direction Sites, or introduce new fees, from time to time. If such a change increases the price payable by you for your existing products or services (including your subscription), Board Direction will provide you with no less than one month’s prior notification of any such change. If you object to any such change, your only remedy is to cancel your subscription before 14 days after the change comes into effect (in which case, no cancellation fee will apply). If you do not cancel your subscription within that period, you will be deemed to have accepted the change. Unless stated otherwise by Board Direction, in order to register for or purchase a service or product, you must submit valid credit card details. Valid payments will be processed immediately or, if applicable, immediately upon the expiry of your free trial subscription. You can cancel or alter your membership at any time (here). Unless you cancel your subscription, subscription fees and all other fees and charges associated with your subscription (including, but not limited to, any applicable federal, state, and local taxes) will be billed automatically to the credit card you provide when registering for the applicable service. If you do not notify us of changes to your billing details, Board Direction will assume that all of the information related to your credit card remains valid and will submit to the card processor all information that it requires for approval. If any subscription fees or other charges billed to your credit card are not processed for any reason, Board Direction shall have the right to suspend your subscription until such subscription fees or other charges are paid in full. You agree to pay all costs (including legal fees) incurred by Board Direction in collecting any unpaid subscription fees or other charges from you. If payment in full is not received from you, Board Direction reserves the right to cancel your subscription. Subscription fees will apply whether or not you actually use your subscription. Unless stated to be otherwise, charges referred to for use of any services provided by Board Direction are GST inclusive. Where GST applies, upon payment for online credit by you, Board Direction will add the GST it incurs from each payment and Board Direction will issue you with a Tax Invoice at the end of the tax year upon your request (which can be made to [email protected]). GST means the Australian goods and services tax charged under A New Tax System (Goods and Services Tax) Act 1999 (the “Act”). Tax invoice means tax invoice as defined by the Act. Subject to any conditions and cancellation fees noted below, you may cancel your Board Direction Site subscription at any time here: https://boarddirection.com.au/my-account/ This will stop future payments. This will not affect your existing membership. You cannot suspend your subscription to any Board Direction Site. No refund will be paid (and no cancellation fee will apply) in relation to any subscription or membership, trial subscription, or yearly subscription. If you fail to cancel, your subscription we will automatically renew it on the subscription expiry date, at the then current yearly subscription rate, and you will be charged accordingly. Should you, within 7 days of having had your membership renewed, cancel your membership via the website (here) a full refund may be provided. Cancelling your membership after this 7 day period will forfeit your right to a refund. When you cancel your subscription or membership, you will still be registered with us and may receive our email correspondence as well as access to the publicly available Board Direction website at no charge. Board Direction may immediately cancel your subscription, without notice or liability (including for any refund or credit to you), if we determine, acting reasonably, that: (i) you have breached any portion of these Subscription Terms or the general terms and conditions for use of the Board Direction Sites or (ii) your use of or access to the Board Direction Site(s) violates any applicable law or regulation or otherwise inhibits any other subscriber from using or accessing the Board Direction Sites or any other service offered by Board Direction on the Board Direction Sites. Board Direction also reserves the right to cancel your subscription for any reason, provided that we give you written notice of such cancellation and, in the event of cancellation, pay you a pro-rata refund for the outstanding portion of your subscription. None of the foregoing limits any other legal, equitable, or contractual rights available to Board Direction. Due to the nature of the service we provide (i.e. the immediate access to the roles we advertise and the thought leadership) we are unable to provide a refund. If, after having completed the NED Program you would like a refund you may request one. The refund provided will be the price of the amount paid minus the cost of the individual services provided within the term of engagement. This includes but not limited to the cost of: CV and LinkedIn writing, career planning sessions, access to advertised vacancies, access to any online or face to face learning and any application support. Full costs of these products and services can be found here: https://boarddirection.com.au/career-services/. Further an hourly fee of $500 an hour for face to face and telephone calls will also be deducted from the amount paid. You may not be entitled to a refund should you not commit to and complete the full program. In particular you must complete all course work, attend all quarterly face to face and monthly catch ups. If you receive a free trial subscription to the Board Direction Site (“Trial”), it will begin on the date on which Board Direction accepts your registration. During the Trial you will not be charged a subscription fee. You may cancel or opt-out of the Trial prior by emailing [email protected] at least 7 days prior to the end of the trial. However, if you do not cancel or opt out during the Trial, you will be automatically rolled onto a paid subscription upon expiry of the and you be charged accordingly, unless otherwise stated during the sign up process. If you have previously received a Trial, you will not be eligible to receive another Trial. Content made available on Board Direction Sites is strictly for personal use only and should not be replicated or forwarded to others without the explicit permission of a Board Direction representative. We may impose limitations on you or cancel your subscription if at any time we form the view that your usage of the site, and particularly your volume of use, is unusual or excessive. As a user of the service who provides Board Direction with your contact details and or resume, you agree to us providing your customer details to corporate clients in the process of conducting a recruitment service, at their request. Board Direction will not be responsible for the use of your information by our corporate clients. (a) The Board roles contained in the boarddirection.com.au site are based on information provided to Board Direction by third parties. 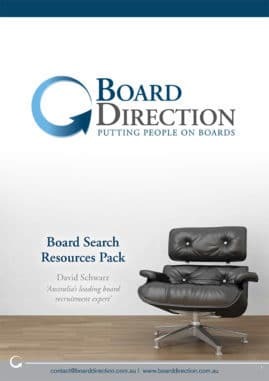 (b) Board Direction has not verified the accuracy, currency, reliability or completeness of the Board Roles and makes no representation or warranty as to their accuracy, currency or reliability. Service charges are non-refundable. Board Direction reserves the right to amend the charges for the service, or introduce new charges, from time to time without providing prior notice to you. If you object to any such change, your only remedy is to cease using the service. If you continue to use the service, you will be deemed to have accepted the change. Unless you notify us otherwise, service charges will be billed automatically to the credit card you provide when registering for the service. You must notify us if your billing details change at any time. Board Direction shall itemise all service on the invoice. Unless stated otherwise, charges are quoted GST exclusive. Where GST applies, Board Direction will add the GST it incurs from each payment and issue you with a tax invoice. You may cancel your registration to the Board Direction service at any time by emailing [email protected] or visiting the FAQ page on the site. Board Direction may immediately cancel your service, without notice or liability (including for any refund or credit to you), if we determine, acting reasonably, that: (i) you have breached any portion of the above terms and conditions or (ii) your use of or access to the service otherwise violates any applicable law or regulation. Board Direction collects your personal information in order to provide you with products and services requested by you, and for secondary purposes related to that purpose. We collect personal information from members and non-members directly (including sensitive information with your consent) to enable us to manage membership, conduct education courses and provide products and services for the benefit of members and non-members. We also collect information indirectly about prospective members through word of mouth referral and publicly available sources. We use information we have collected about members and non-members, including through our website and social media to assess and meet the needs and interests of members. We don’t disclose information about you unless you agree or would expect us to. We disclose limited information about event and course participation to sponsors and potential sponsors under strict conditions. We publish information about members to other members via our website and regular emails – for example, about new members or thought leadership which might include members or non members. Under Corporations law, we must allow an individual to inspect the Board Direction member register and view current and past members’ names and addresses. Some of our contracted service providers are located in other countries. We take reasonable steps to ensure that the host does not breach the APPs. You have a right to ask for access to the personal information we hold about you and ask us to correct any wrong information. You can opt-out of receiving marketing communications from us by unsubscribing to our emails. You can complain to us in writing about how we handle your personal information. We will respond as soon as possible. If you are not satisfied you can complain to the Office of the Australian Information Commissioner. “Administrator” means the Service administrator(s); an individual or individuals appointed by the Subscriber to provide access to and use of the boarddirection.com.au Administrator to tailor the Service access levels and user functionality for the Subscriber’s specific needs. “Effective Date” means the date as set out in the Product Schedule, or if undated, the date of first availability of the Service for use by the Subscriber. “Fees” means the aggregate of the fees for the Information and fees for the Service, payable by the Subscriber to Board Diversity being bundled, packaged or amended as set out in the Pricing Schedule. “Initial Term” means 7 days. “Pricing Schedule” means the Subscription Agreement, including any updated or amended versions of it. “Product Schedule” means the Subscription Agreement, including any updated or amended versions of it. “Representatives” means, in relation to the Subscriber. 2.1. Board Direction will supply the Information through the Service to the Subscriber and grants to the Subscriber a non-exclusive, non-transferable, non-sublicensable, non-assignable license to use the Information and the Service pursuant to the terms of this Agreement. 2.2. Board Direction retains control and ownership of the form and content of the Service. Neither the Subscriber nor any User will acquire any ownership rights in the Service or the Information, and the Subscriber shall not alter the form or content of the Information or Service without the written permission of Board Diversity. 2.3. Board Direction may alter the form and content of the Service from time to time. The Information is either licensed from third party information providers or is proprietary to Board Direction. Should any license agreement with an information provider be terminated or suspended for any reason then the Information supplied by that information provider may be withdrawn from the Service. 2.4. The Subscriber acknowledges that any indexing codes used for retrieving Information from the Service are owned by either Board Direction or a third party, and that such indexing codes are protected by copyrights, database rights and/or trademarks owned by the relevant party. The Subscriber may use the indexing codes solely to access information from the Service and may not otherwise copy, publish, redistribute or otherwise use such codes. e. share the password which they use to access the Service with any other person. Users should notify the Administrator or Board Direction if they learn or suspect that any password(s) is either being used by any person not authorised by the Subscriber to use the Service or is being used by more than one User. d. provide Board Diversity with reasonable assistance in complying with Board Direction obligations under privacy laws relating to information in respect of individual Users. Subscriber warrants and represents to Board Direction that it is authorised by each of the Users to receive the Users’ personal information from Board Direction. 3.5 Board Direction will issue the Subscriber with one password for each User, each such password may only be used by one individual. The Subscriber must notify Board Direction if it learns or suspects that any password(s) is either being used by any person not authorized by the Subscriber to use the Service or is being used by more than one individual. Board Direction will then cancel the relevant password(s) and assign a new password(s) to the Subscriber. Board Direction may in its reasonable discretion attach conditions to the assignment of such new password(s). 4.1 The Subscriber agrees to pay the Fees and any Additional Fees to Board Direction within 30 days of receipt of an invoice from Board Direction (‘Invoice’). 4.3 If GST is payable on any taxable supply made or to be made under this agreement, the consideration payable will be increased by an amount equal to the amount of GST payable by the Subscriber. The Subscriber agrees to pay. 4.4 The Subscriber shall have the right to withhold any applicable taxes from payments due under this agreement as required by law. If any deduction from payments due under this agreement is required on account of a withholding tax, the Subscriber will provide Board Direction with a certificate or other receipt signed by the appropriate taxing authority confirming the tax withheld and the subsequent payment of the tax to the taxing authority. Where there is a reduction in any Fees or Additional Fees due that is not supported by such a certificate or receipt, the reduction will be considered an underpayment by the Subscriber. 4.5 The Pricing Schedule may be amended from time to time in accordance with clause 4.6. Other than as set out in the Pricing Schedule or pursuant to clause 4.6, no change in the Fees payable by the Subscriber shall be effective unless agreed in writing between the parties. 4.6 Board Direction may, following not less than 30 days’ prior written notice to the Subscriber, amend the Pricing Schedule and/or any Schedule setting out the Additional Fees. If the amendment to the Pricing Schedule results in an increase in the Fees for the Subscriber, then the Subscriber may, within 30 days of receipt of such notice, terminate this Agreement by written notice to Board Direction. If the amendment to any Schedule results in an increase in the Additional Fees for the Subscriber, then the Subscriber may, within 30 days of receipt of such notice, terminate that part of the Service that relates to the Additional Fees by written notice to Board Direction. If the Subscriber gives notice pursuant to this clause 4.6then such termination shall be effective on the date on which the Fees and/or any applicable Additional Fees would have increased and the Subscriber will be entitled to a pro rata refund of any Fees or Additional Fees paid in advance for services not rendered at the date of termination. 5.1 Board Direction shall make reasonable efforts to ensure: the accuracy and reliability of the Service; the timeliness of the Information; and that the Service does not contain any computer virus. Neither Board Direction, nor any other member of the Board Direction, will be held liable in relation to the accuracy or timeliness of the Information or for any loss or damage of any type in connection with the provision of or failure to provide the Service, except as set out in this clause 5. This Agreement gives neither the Subscriber, nor any User or Customer any rights against third party information providers with respect to the use of Information. 2. in the case of goods supplied or offered by Board Direction, the replacement of the goods or the supply of equivalent goods, the repair of the goods, the payment of the cost of replacing the goods or the payment of the cost of having the goods repaired. 5.3 Subject to the above qualifications and clause 5.4, the Subscriber expressly agrees that in no circumstances will Board Direction or any member of the Board Direction be liable for any damage or loss (including but not limited to any indirect or consequential loss or any loss of profits or revenues whatsoever) however caused (including but not limited to, by the negligence of Board Diversity or a member of the Board Direction) suffered or incurred by the Subscriber in connection of the use of afr.com. 5.4 Board Direction shall indemnify the Subscriber against any direct loss or damage suffered by the Subscriber arising out of any third party claim or action that the Information infringes the intellectual property rights of such third party, except for any claim or action arising out of a breach of this Agreement by the Subscriber, any User or Customer. The Subscriber agrees that if any such claim is made by a third party then the Subscriber will promptly notify and cooperate with Board Direction, and Board Direction shall at its request be given control of such action. 5.5 The Subscriber shall indemnify Board Direction and, where relevant, any third party information provider or supplier, for any direct loss or damage (not including any consequential loss or special or punitive damages) arising out of any use of the Information by the Subscriber and/or Users and/or Clients beyond the rights expressly granted to the Subscriber and/or the Users and/or Clients under this Agreement. 5.6 The total liability of Board Direction under this Agreement shall, to the extent permitted by law, under no circumstances exceed the Fees paid by the Subscriber in the twelve months preceding such claim. 6.1 The Trial Term, if any, is set out in the Product Schedule or as agreed and/or amended by writing between the parties. 6.2 After the Trial Term (if any), this Agreement shall be renewed for the Initial Term unless the Subscriber notifies Board Direction otherwise in writing prior to the end of the Trial Term. Thereafter this Agreement shall automatically be renewed for successive 12 month periods on the Renewal Date and each anniversary of the Renewal Date, save that during the Term any Service may be cancelled by either Board Direction or the Subscriber/Member on 14 days’ prior written notice to the Renewal Date and each anniversary of the Renewal Date. 6.3 On termination of this Agreement for any reason other than for Board Direction being in breach of this Agreement or being subject to an event listed in clause 6.3 (c), the Subscriber/Member shall pay to Board Direction any Fees or Additional Fees payable until the end of the then current Term. 6.4 lf the Subscriber/Member commits a material breach of this Agreement, Board Direction may suspend any Service without notice or penalty until such breach is remedied. 7.1 The parties acknowledge and confirm that during the term of this Agreement and following its termination the parties shall treat as confidential and shall not (other than in the proper provision of the Service or as required by any applicable law) use or disclose to any person, firm or company, the terms of this Agreement, including the Pricing Schedule agreed between the parties, and any confidential information relating to the business of and belonging to the other party, nor permit its use or disclosure. This obligation of confidentiality shall not apply to information which is publicly known (through no fault of the non-disclosing party) or not of commercial value to such other party. 8.1 Board Direction chooses the internet sites through which the Web Content is made available and uses reasonable care in doing so. However, the Web Content is not made available through any licensing agreement with any third party, and accordingly Board Direction does not and cannot license the use of such Web Content. The Subscriber/Member and Users are solely responsible for determining the extent to which the Web Content is used. 8.2 The Web Content is not included as Information for the purposes of this Agreement and Board Direction does not accept any liability in relation to the Web Content. 9.2 Neither party may assign the Subscription Terms without the prior written consent of the other party, provided however that Board Direction may transfer any of its rights and obligations to any member of the Board Direction. 9.3 The official language of the Subscription Terms shall be the English language and no translation into any other language may be used in its interpretation. 9.4 The Subscription Terms shall be governed by, construed and take effect in accordance with the laws of New South Wales and the parties submit to the exclusive jurisdiction of the courts of New South Wales.